Oprah's Book Club 2.0 selection: This special eBook edition of Cheryl Strayed’s national best seller, Wild, features exclusive content, including Oprah’s personal notes highlighted within the text, and a reading group guide. I jumped right in and fell in love with Strayed from the get-go. Her writing is easy to read, and the flashbacks to her life really resonated with me why she would hike the PCT. Going to read her other books now. SO GOOD! I loved this book so much I didn't want it to end. 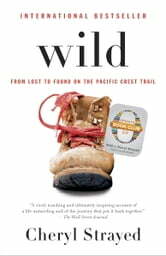 'Wild' is a beautifully descriptive story about loss, pain, nearly giving up, and pushing on. I loved every moment of this book and am just blown away by the author's audacity and perseverance to achieve her goal. I personally will never be able to go three months in the wild,with a pack so heavy in my back, blistered feet, bleeding and sore, filthy, hungry and lonely. I couldn't believe she kept going, hiked 1100 miles solo on the PCT enduring scorching temperatures on the desert or frigid weather from the High Sierra Mountains, and wild animals but despite all that and the mental and physical tiredness she never gave up and accomplished her soul finding with every step she took in her journey. The bravery and willpower flowed from the pages of this book touched me deeply. It was a great book to read.